The Government is confident that the cattle disease M. bovis can be eradicated in New Zealand. It would be a world first if successful. “Based on all the evidence presented to us, we are confident that eradication is possible and that we are on track in what’s a world first but necessary action to preserve the value of our national herd and economic base, Biosecurity Minister Damien O’Connor said today . .
Federated Farmers is supportive of today’s government call that we may be able to achieve the biosecurity triumph of being the first country in the world to eradicate Mycoplasma bovis. While there are farmers throughout the country still battling with the aftermath of the disease’s discovery, Feds believes we can all start to feel more confident about the outcome of the eradication. “We are cautiously optimistic, and still have fingers and everything else crossed,” Federated Farmers dairy chair Chris Lewis says. . . The Ministry for Primary Industries’ Sustainable Land Management and Climate Change (SLMACC) research programme supports the generation of new climate change knowledge across NZ’s agriculture and forestry sectors. The independent review found SLMACC has triggered new research and boosted NZ’s understanding of the potential impacts and implications of climate change for a range of primary industries, particularly pastoral farming systems and responding to drought. . .
Tiaki, the sustainable dairying programme launched by Fonterra last year, is ticking all the boxes for farmers. The programme, which helps farmers farm in more sustainable ways, has been in place for a year. At its launch Fonterra set an initial target of having 1000 farm environment plans in place. “When we committed to the programme we increased the number of sustainable dairy advisers we had in the field,” Fonterra sustainable dairying general manager Charlotte Rutherford said. “However, demand has outstripped supply. . .
A cohort of 27 new NAIT compliance officers are ready to hit the ground and start working with farmers after graduating from their training programme on Friday. Animal Welfare and NAIT Compliance Manager, Gray Harrison, says the new officers are part of a stepped-up effort to educate farmers about their NAIT obligations, and enforce compliance with the scheme. “The new officers will be located throughout the country helping farmers use NAIT consistently and taking action when non-compliance is detected. . .
Ngāi Tahu Capital has taken a direct stake in PGG Wrightson, ending a seven-year relationship with Singapore-domiciled Agria as the foreign investor’s grip on the rural services firm remains uncertain. Last Friday, the investment arm of the South Island iwi ended an agreement that pooled its investment in Wrightson with Agria and Chinese agribusiness New Hope International. Ngāi Tahu Capital was a junior partner in the joint venture with a 7.24 percent stake. At the time, it touted the $15 million investment as diversifying its portfolio and building international relationships. . .
Hi Fidelity Genetics (HFG), a company that uses sensors, data science, and statistical genetics to create non-genetically modified crops, just raised $8.5 million in a Series A. It’s a sign of the growing importance of data science in agriculture, and it may signal an alternative path to sustainable farming without the use of genetic modification. The issue is a prickly one. Genetically Modified Organisms (GMOs) have been touted as saving the world by increasing food supply and maligned as a lever by which Big Ag constrains the market while doing untold damage to public health and delicate ecosystems. As the debate rages on, GMOs have come to dominate agriculture, accounting for more than 90 percent of the corn, soy, and cotton grown in the U.S., according to the USDA. . .
“Govt won’t fix Fonterra’s problems” – so ran the strapline on the NZ Herald’s weekly “The Business” last Friday. And thousands of Fonterra’s farmer-suppliers, reading the article which quoted Agriculture Minister Damien O’Connor, almost certainly would have sighed with relief. Who would want this government to “fix” their industry? Look what happened to the oil and gas exploration industry after Energy Resources Minister Megan Woods applied her “fix” to it. . .
(BusinessDesk) – New Zealand trade negotiators are trying to get their European counterparts to recognise that the nation’s agricultural exports are small-fry in comparison to the regional bloc’s farming sector. The second round of free trade negotiations between New Zealand and the EU is underway in Wellington, with 31 European officials in the capital to make progress in a deal politicians say they’re keen to fast-track. In a 90-minute public forum, the chief negotiators – Peter Berz for the EU and Martin Harvey of the Ministry of Foreign Affairs and Trade – said there was a lot of commonality between the parties, but that agriculture is a sticking point. . .
A new device that detects processing losses in dairy plants could save the industry millions of dollars a year and help prevent pollutants from entering waterways. Lincoln University-owned research and development company, Lincoln Agritech Ltd, developed the breakthrough technology and it was then commercialised by Christchurch-based start-up company, CertusBio. The result is a robust, automated biosensor capable of continuous monitoring in commercial operating conditions. Known as Milk-Guard, the device uses a lactose-specific enzyme to measure the percentage of dairy products present in waste streams and processing lines.. . Even though it was very much tempered by sitting much closer to the front than the back, 17 hours is a hell of a long time to be stuck on a plane. The Auckland-Dubai direct flight is the third-longest commercial flight on the planet, behind Auckland-Doha and Perth-London. The world faces a food crisis. How to feed a potential population of 10 billion people by 2050? In 1960 we had more than one acre (0.4 ha) of arable land for every person on the planet. Today that number is less than half that. Many of our most productive soils now grow only houses. . . Since announcing its environment strategy in May, the Beef + Lamb New Zealand team responsible for developing the plans, processes and tools to help farmers achieve the ambitious goals of being carbon neutral by 2050 and every farm having an active farm plan by 2021 has been working flat out to get the right farm planning systems in place. The strategy identifies four areas of focus – cleaner water, carbon neutrality, thriving biodiversity and healthy productive soils – with their own specific goals and a detailed implementation plan, supported by a series of what are termed ‘foundations’. Initially there are two foundations which explicitly rely on the participation of individual farmers. The first is helping farmers navigate the myriad of farm environment plans out there so they can identify the one that complies with local regulations and is best suited to help them document their individual on farm environment plan; the second foundation will encourage the establishment and facilitation of catchment communities which are relevant to the farmers’ local areas. . . Premium New Zealand wool carpets and rugs will soon be available to thousands more US consumers under a new distribution partnership between Carrfields Primary Wool (CP Wool) and J Mish Mills. Under the agreement, leading carpet business J Mish will design and manufacture carpets and rugs from yarn grown and spun in New Zealand. The products will then be distributed throughout the US via J Mish’s large network of dealer and designer relationships. . .
A feral ewe captured on a remote bluff will have her first brush with the shears this weekend and organisers say she could have the longest wool in the world. The crossbred sheep was caught in the Mapiu district, south of Te Kuiti, by Amie Ritchie and Carla Clark. Named Suzy by her captors, the ewe is not believed to have been shorn before. However, that will change at The Wool Shed, the national museum of sheep and shearing, in Masterton on Sunday. . .
We’re an odd country when it comes to trees. We have a lot of them but no overarching long-term policy for them. Consequently, our short-term forestry decisions deliver some adverse outcomes, both economic and environmental. And on our current course it’s going to get worse. We’re racing to plant one billion trees in a decade to help us meet our climate commitments (as last week’s column discussed), develop regional economies, reduce soil erosion, improve water quality, and enhance biodiversity such as helping to save native birds from extinction. Trees could do all of that for us. But only if they can flourish in healthy ecosystems. To do so, they need all the help we can give them over three or four human generations. Instead, we’re working in silos over just a decade or two, the longest time most commercial enterprises can wait for an investment to pay off. . .
Cannabis-focused biotechnology company, Helius Therapeutics, announced today it has completed its $15m capital raise and is now backed by a small group of New Zealand investors, led by tech entrepreneur, Guy Haddleton. Haddleton says “Helius Therapeutics has all the features we seek in a high-potential investment. The company has a clear and large vision, extraordinary talent and deep go-to-market experience. More importantly, Helius will improve significantly the quality of life for hundreds of thousands of New Zealanders”. . .
Alliance Group has warned that its annual result, due to be reported in November, will show a drop in profit. “The financial performance of the company this year will be down… meaningfully,” chief executive David Surveyor told farmers attending the company’s roadshow meeting in Cheviot last week. However, he assured shareholders the company is profitable, the balance sheet remains “incredibly strong, and for the avoidance of any doubt we have the ability to make sure we build our company forward.” . .
Only three farms have been confirmed through bulk milk testing as having Mycoplasma bovis – but the Ministry for Primary Industries says it is too early to speculate about final results. The second bulk milk surveillance programme was being undertaken now as spring was the best time to test for the disease, the ministry said. Infected animals were more likely to shed the bacteria after a stressful period, such as calving and the start of lactation. To date, almost 10,000 of the country’s 12,000 dairy farms had completed two rounds of testing, MPI said in an update. (BusinessDesk) – The government has paid $25.6 million in compensation claims related to Mycoplasma bovis and remains committed to phased eradication, said Prime Minister Jacinda Ardern and Biosecurity Minister Damien O’Connor. One of the biggest challenges for farmers has been navigating the compensation process and Ardern and O’Connor announced a new recovery package aimed at making that easier. The package includes a team of rural professionals who understand both farming and the compensation process who can sit down and work with farmers on their claims. The Ministry for Primary Industries has also produced an improved compensation form and guide and an online calculator of milk production losses. It will also provide regional recovery managers for key areas. . . .
Marc Rivers has a TEDx talk. And it’s not about numbers, profit and loss – and there is no mention of balance sheets. Rivers, Fonterra’s top number cruncher, is not your typical chief financial officer. Unlike their charismatic chief executive counterparts, chief financial officers are generally regarded as robotic accountant types, capable of presenting a company’s financial position in jargon that few people understand. . .
A recent survey has found that 70 percent of rural New Zealanders have felt more stress over the last five years. The State of the Rural Nation Survey, conducted by Bayer New Zealand and Country TV, asked participants several questions regarding their views on critical topics impacting rural New Zealand today, including a series of questions around mental health. Of those who responded that they had felt increased stress over the last five years, over half (54 percent) attributed financial pressures as the main reason, while the impact of environmental factors (ie droughts, flooding, hail) on people’s work and livelihoods came in at a close second (49 percent). . . Embracing gene editing could have huge benefits for New Zealand’s primary industries and we shouldn’t be scared of the technology, scientists say. The latest paper in a series from the Royal Society Te Apārangi outlined five ways gene editing could be used in farming and forestry and scientists are keen for Kiwis to discuss the issue. It sounds scary, though. So what’s it all about? Gene editing (also known as genome editing) is the targeted alteration of a specific DNA sequence. While older genetic modification technology typically added foreign DNA to a plant or animal, gene editing involves precise modification of small sections of existing DNA. . .
NZ Young Farmers has organised five of the Good Yarn workshops, the second of which was held in Carterton last week. Greytown dairy farmer Rachel Gardner, one of 14 attendees last week, is encouraging other young people to talk about mental health. . . It will enable a commercial pilot of the MEQ Probe technology, which uses nanoscale biophotonics to measure the marbling and tenderness of meat; both major drivers of eating quality. . .
A substantial blueberry orchard with its own commercial processing plant and refrigerated pack-house – producing one of the rarest but highest-yielding blueberry crops in New Zealand – has been placed on the market for sale. The 8.8-hectare property at Gordonton in the Waikato features some eight hectares of blueberry plantings under canopy cover, along with buildings, equipment, and plant used for picking, sorting, packing and chilling blueberries. Planted on peat soil and regularly fertilised, the orchard has some 15,000 trees – including 500 of the new Jaac variety of blueberry which produces a heavier-yielding crop than traditional clones. Other blueberry varieties grown in the orchard include Powder Blue, Tiff Blue, Centra Blue, O’Neal, Sunset, and Velluto. . .
Economists and business writers tread a fine line between staying true to the data and the reality of the experience suffered (or enjoyed) by individuals. There is a risk of coming across cold and robotic. Take the Mycoplasma bovis outbreak. I felt a little cold hearted this week pointing out the scale of the cattle cull is not statistically large. . .
Mycoplasma bovis-affected farmer Kerry Dwyer believes the huge amount of stress placed on farmers through the massive cull of cattle will not be worth the result. Last Monday, the Government unveiled an $886 million plan to eliminate the disease, rather than undertake long-term management. If successful, New Zealand would be the first country in the world to do so. The cull, of about 126,000 cattle in addition to the 26,000 well under way, would take place over one to two years. Mr Dwyer, who voluntarily sent 400 calves to slaughter, said success relied on the premise the Ministry for Primary Industries (MPI) testing regime was accurate and no animals “slip through the net . . The heat was on Ministry for Primary Industries officials as they sat before 800 farmers at a where-to-from-here Mycoplasma bovis meeting in Ashburton last week. As the questions and criticism flew from the floor so did the eyebrows rise at the front table that included MPI director-general Martyn Dunne, MPI response veterinary adviser Eve Pleydell and Agriculture Minister Damien O’Connor. The turnout was indicative of the concern the district stands to lose 25% of its dairy herd. . .
An offer of free mānuka seedlings has been so popular, the scheme is almost 200 per cent oversubscribed. Mānuka Farming New Zealand (MFNZ) offered 1.8 million seedlings to landowners, enough to cover about 1635 hectares across New Zealand. Within a week, 70 applications were received, accounting for 3.6 million seedlings. . .
Every day Patrick Johnson dresses up for work and sings to a crowd of 750 for about three hours. But Johnson’s not a musician; his costume is an apron and gumboots and the audience never applaud him – they’re cows. Johnson is a South Taranaki dairy farmer who recently started recording himself singing while he was milking cows and posting a video on the internet everyday in an attempt to make fellow farmers smile. . .
Andrew Curtis has no interest in “getting back to old Blighty”. The affable English-born chief executive of Irrigation New Zealand (INZ) is happily settled in Canterbury with his family. Their lifestyle block is stocked with Belted Galloway cattle and they consider New Zealand “home. . .
I’m proud to say that I’m a fourth-generation farmer. I had a rural upbringing on a cattle and dairy farm near Tamworth and still have a commercial farm in the NSW Central Tablelands. Throughout my childhood we, like most farmers, hit both bad times and good and I thank this rural upbringing for instilling in me a work ethic and a certain toughness. It also gave me a genuine understanding of just how hard farmers work to supply us with the food we rely on at every meal and the quality we demand. With all the discussion these days about food and sustainability, many of our farmers are struggling to be sustainable in even the most basic sense of making ends meet. . . The Government says it has reached an agreement with farming sector leaders to attempt to eradicate the disease from New Zealand. The cull, of around 126,000 in addition to the 26,000 already underway, will take place over one to two years. Prime Minister Jacinda Ardern said to not act would cost even more than what would be spent on trying to eradicate it – $886 million. $1.3b over 10 years was the estimated cost of not acting. “Today’s decision to eradicate is driven by the Government’s desire to protect the national herd from the disease and to protect the base of economy – the farming sector,” Ardern said. “This is a tough call – no one ever wants to see mass culls. But the alternative is the spread of the disease across our national herd,” she said. “I personally do not want to look back on this time … and say I wish we had tried harder. “We have this one shot to eradicate, and we are taking it together. “We want New Zealand to be free of it,” Ardern said. The Government will meet 68% of the cost and Dairy NZ and Beef and Lamb New Zealand will meet 32%. . . Farmers have mixed views on the wisdom of this decision but it’s backed by DairyNZ, Beef + Lamb, Federated Farmers and the National Party. . . “I’ve also asked MPI to revisit the compensation process and they’ve developed a new streamlined approach for those whose animals are culled to enable a substantial payment within a matter of days. “Farmer welfare is crucial and I’d like to thank the Rural Support Trusts for the work they’re doing. With this decision we know more help is needed and the Government and industry groups are committed to helping farmers through this stressful time. . .
. . When the dust settles, and the debate about eradication – or not – is over, MPI needs to start listening. Listening to farmers, to vets, to business people. Because I think MPI’s biggest job is not getting rid of M. bovis, it’s regaining trust. . . It doesn’t stop there, however. Criticism of MPI is also happening in the supermarket aisles, over the bar in rural pubs and over farm fences. Most importantly, it’s happening at the dining table, shaping the attitudes of the next generation of farmers. Many are probably saying the same things as the infected farmers – but some are undoubtedly going further. In South Canterbury, there’s talk that there have been signs of disease in some herds for years. Given what’s happened, some are asking why authorities were told at all. That’s the biggest problem. A few people tell me the way MPI has handled this outbreak means, they think, some farmers won’t be inclined to report problems in the future. They don’t think MPI has their back. This is not to defend such behaviour, but to give the authorities a heads-up. If that attitude spreads like M. bovis has, there’s trouble ahead. As with TB, farmers must be confident that if they report a problem it will be taken seriously, they will be treated fairly and compensated quickly. Without that confidence, some farmers will be tempted to quietly shoot and bury infected stock. Of course, in Roger Smith’s perfect world, everyone would do the right thing. But human nature – as proved by the failure of the National Animal Identification and Tracing (NAIT) system – tells us that doesn’t always happen. MPI can’t possibly put field officers in every farm, so it has to rely on farmers to report problems. But this mood of mistrust, born of M. bovis, creates a climate of fear and self-reliance rather than faith in the system. The country needs faith, however, and it’s up to MPI to restore it. What we’ve seen in recent months, however, is farmers turning on farmers, as the secrecy over which farms are infected leads to suspicion and accusation, not just about who knew what but when they knew it. The slowness or non-existence of compensation payments is an added stress. Businesses are failing, people are struggling and MPI is coming across as detached and cold-hearted. At a national level, Federated Farmers says its members have to lift their game, particularly when it comes to animal identification and tracing. (Northland’s branch is calling for a full, independent inquiry about MPI’s approach to biosecurity.) Agriculture and Biosecurity Minister Damien O’Connor has instructed officials to take a tougher approach to compliance with the tracing system, NAIT. These conversations should have been had years ago. Problems with NAIT – both the system itself and compliance – must be addressed and addressed quickly. The tougher conversations are to be had face-to-face with farmers. Yes, there needs to be a better job of selling the benefits of NAIT – that’ll help uptake. But the crucial conversations will be farmers telling MPI what they need, how best to help them and how, when the next outbreak hits – because it will – the ministry can improve its response. Of course, just because the farmers are talking, doesn’t mean that MPI will listen. MPI has lost the confidence of farmers. They didn’t appear to realise the human and financial cost to farmers whose businesses have been threatened and the importance of clear communication and speedy settling of compensation. Eradicating M. bovis must be its primary focus but it must take seriously the criticisms aimed at it and ensure that its systems and staff training improve so it and they regain farmers’ trust and are ready and able to respond faster and better to the next biosecurity incursion. MPI’s media release gives some hope that it has already learned from its mistakes. We understand this will be painful for farmers who are affected, and we are committed to looking after those who have Mycoplasma bovis on their farms. If you are a farmer and need support, help is available through your industry group representative, individual response case manager, or the Rural Support Trust. We’re calling on rural communities to support each other, especially affected farmers and those that appear to be finding it hard. If you have any concerns about someone you know, contact the Rural Support Trust or other community support services. 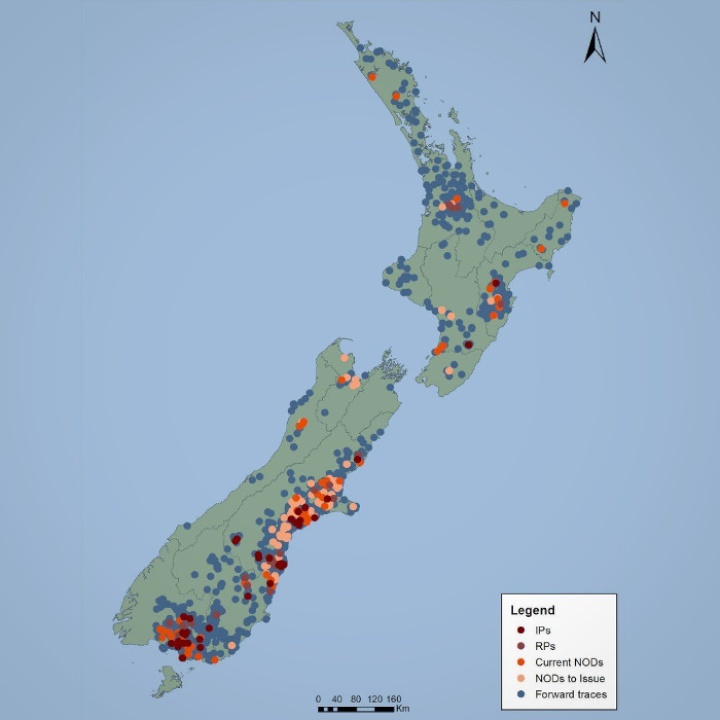 Compensation is available for anyone who has verifiable losses as a result of directions they are given by MPI under the Biosecurity Act to manage Mycoplasma bovis. Farmers that are directed to have animals culled or their farm operations restricted under movement controls will be eligible for compensation. In particular, farmers whose animals are being culled will receive an initial payment for the value of culled stock within 2 weeks of a completed claim being lodged. There are going to be huge challenges for MPI. To date, they have not covered themselves in glory. All members of their response team will have been working hard within imposed limits, but the MPI system has let them down with too many layers of management and an inability to make timely operational decisions for each farm. The most urgent issue right now relates to all of the NOD (suspect) farms in the South Island that have their cows and their feed in different locations. As just one example of many, there is a Mid Canterbury farmer I know of who is caught in the constipated bureaucracy and as of today still cannot get approval to shift his stock less than two kilometres to another farm he owns (and which he agrees will then also become a NOD farm). These cows need to be moved and should have been progressively moved over recent weeks as they were dried-off, if they are to have feed to eat. This farm is not one of the infected properties, rather it is just one of the 300 NOD suspect properties. We don’t know how many farms are in this situation of cows isolated from their winter feed, but almost certainly well over 100. This is not the ‘gypsy day’ situation but something quite different. And it is a big animal and human welfare issue. There should be no hold-up over permission to move stock from one block to another owned by the same farmer who agrees to it becoming a NOD farm. The Government appears to be underestimating the complexity of the compensation claims. The challenge is that claims have to be ‘verified’, but loss of income claims are always debatable. Claim settlements require agreements on what would have happened and by definition that is impossible to verify objectively. An MPI source advises that any claim over $75,000 requires five separate signatures across various ministries from within the Wellington bureaucracy after the technical assessors have reached agreement. Given the future tsunami of claims, from both infected and suspect properties, and the reality that almost no claims have yet to be settled except in partial amounts, there will be a need for a separate and preferably independent Claims Assessment Commission. . . This map shows the extent of the known spread of the disease. It looks bad and it is. But so far all cases can be traced back to a single source, all infections are the same strain and nothing has been traced back further than 2015. It is a lot of farms and a lot of cows and devastating personally and financially for those affected. Eradication will require a huge effort by the farmers affected and MPI and big changes within the dairy industry and those who support and service it.